Ab response kinetics following PC-KLH immunization. A, PC-specific Abs in ppc1-5H/B6 and non-tg/B6 mice were measured by a solid-phase ELISA. The plates were coated with PC-histone and the Abs were detected with anti-IgMa or anti-IgG1a for ppc1-5H sera and with anti-IgMb or anti-IgG1b for non-tg B6 sera. Sera were diluted 1/500, and the A405 values were compared with the pooled preimmune sera included in each plate to calculate the titers of anti-PC Ab: 1 U was defined as the fold increase in A405. 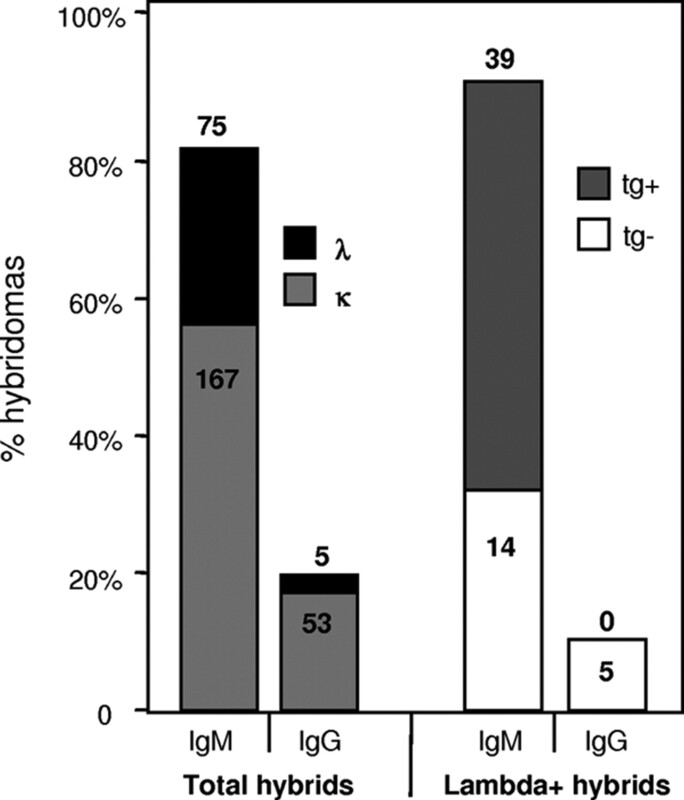 B, IgMa-λ1 and IgG1a-λ1 Abs were determined by ELISA. Plates were coated with anti-IgMa or anti-IgG1a and the serum Abs were detected with anti-λ. Sera were diluted 1/1000 and the A405 values were compared with the pooled preimmune sera included in each plate to calculate the titers of IgHa-λ Ab: 1 U was defined as the fold increase in A405. The data represent the mean ± SEM from three to eight mice per time point. Arrows indicate the time of immunization. AFC formation and GC reaction in ppc1-5H sd-tg mice. A, EF AFC formation in ppc1-5H mice during primary (7 days after the first immunization) and memory (9 days after the third immunization) responses to PC-KLH. Splenic sections were stained with anti-λ1 (brown) along with anti-IgMa or IgG1a (blue). B, Immunohistochemical analysis of GC reaction in ppc1-5H sd-tg mice during memory response (9 days after the third immunization). Consecutive splenic sections were stained with anti λ1-GL7 or anti λ1-IgMa Abs. Many λ1+IgMa+ B cells are present in GL7+ GCs. The lack of staining in the GC dark zone is likely due to the down-regulation of surface Ig on centrablasts. These are representative sections of three to five mice of each group. Original magnifications, ×100 and ×400. 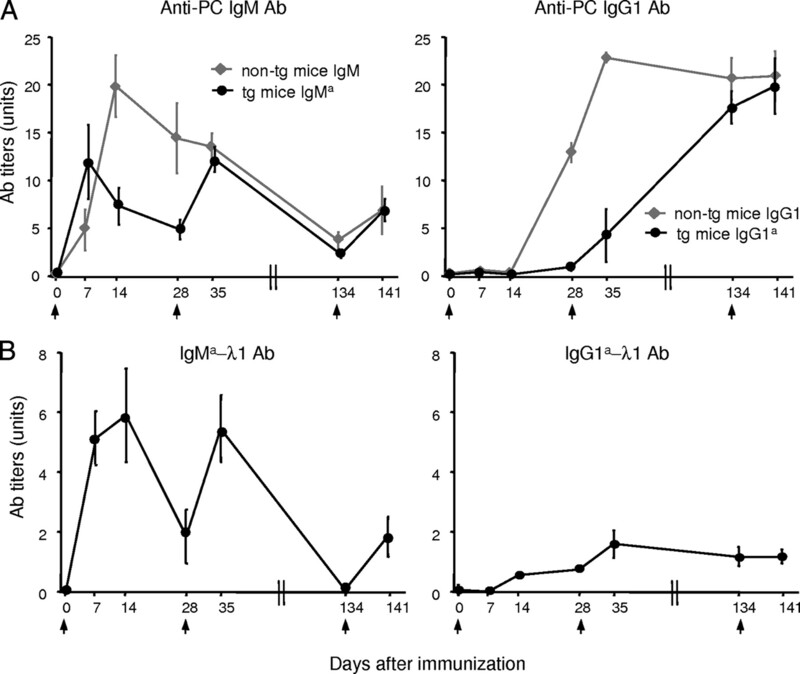 C, Flow cytometric analysis of λ1-IgMa B cells isolated from the ppc1-5 sd-tg mice before and after PC-KLH immunization (8 days after secondary immunization). Levels of GL7 expression are shown as a histogram. At least five mice from each group were examined; plots shown are representative. Analysis of hybridomas derived from the ppc1-5H sd-tg mice following PC-KLH immunization. Hybridomas were generated from splenic B cells of five ppc1-5H sd-tg mice 3 days after PC-KLH memory challenge (see Materials and Methods for details). Ig isotypes were determined by ELISA. The presence or absence of the ppc1-5H sd-tg was determined by PCR and/or sequencing. Somatic mutations in VH and Vλ genes of F2-6 and F2-12 hybridomas. The top line shows portions of the germline sequences of ppc1-5, Q52.2.4, or Vλ2. Sequence identities to germline are shown as dashes and nucleotide deletions as asterisks. Sequences are numbered according to Kabat et al. (71 ). The codon numbers may not be in consecutive order (such as that of ppc1-5 FWR2) due to space limits. VH replacement of ppc1-5H sd-tg. A, VDJ junction sequences of VH genes that have undergone VH replacement. The top line shows the ppc1-5H VDJ sequence. The 3′ end heptamer is shown in the box, the junction in bold, the DH underlined, the N additions in italic, and the P nucleotide in capital letters. 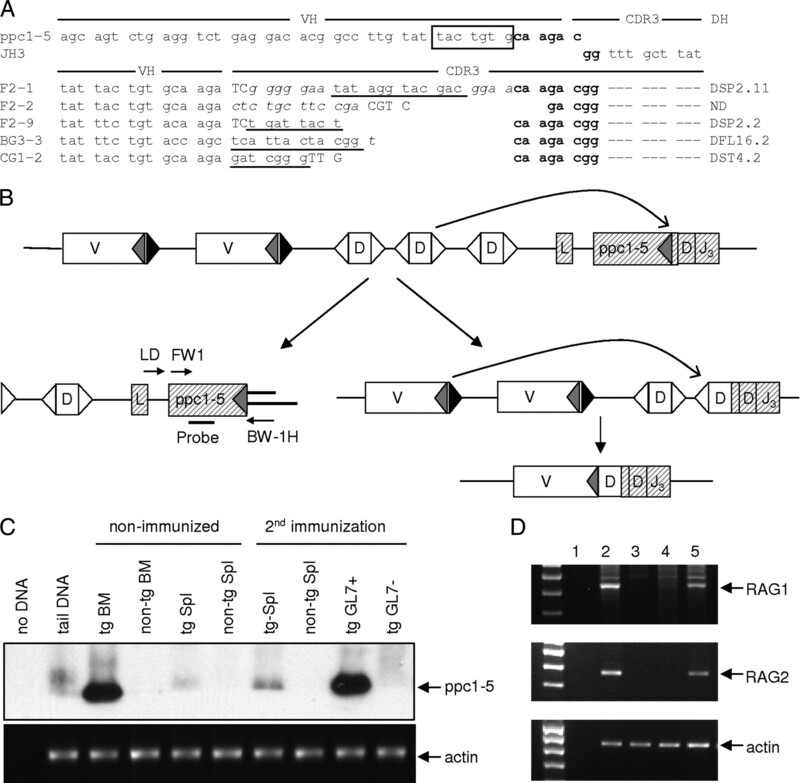 B, Schematic representation of VH gene replacement at the ppc1-5H sd-tg locus. The initial rearrangement involves D→VDJH invasion and the subsequent VH→D-VDJH rearrangement results in a new functional VH gene. The excised ppc1-5 VH along with the intervening D segments are shown. 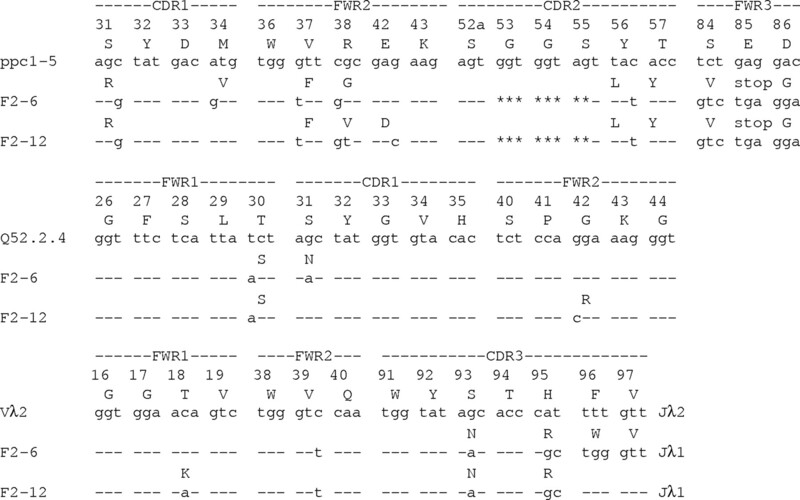 The positions of the BW-1H linker, PCR primers, and hybridization probe are indicated. C, LM-PCR detection of dsDNA breaks at the ppc1-5 VH recombination signal end. Bone marrow and splenic DNA samples from the naive and immunized mice were subjected to LM-PCR followed by Southern blotting for detection of VH signal breaks. The actin gene was amplified as a control for DNA input. D, Detection of RAG1 and RAG2 transcripts by RT-PCR. PCR products were detected by ethidium bromide staining. Lane 1, Negative control (no transcriptase); lane 2, ppc1-5 bone marrow cells; lane 3, ppc1-5 tail RNA; lane 4, spleen cells from nonimmunized ppc1-5H mice; and lane 5, spleen cells from immunized ppc1-5H mice. β-Actin was used as a control for mRNA input. C and D, Each sample is representative of two experiments, each with a mixture of cells from three mice of the indicated group. Proposed developmental pathways of NAA and non-NAA B cells in ppc1-5H sd-tg mice during anti-PC-KLH-immune response. In the preimmune mature B cell repertoire, the NAA B cells (ppc1-5H/λ) constitute ∼30% of the B cells and the remaining 70% are non-NAA B cells (ppc1-5H/κ and non-tg). After the first immunization with PC-KLH, the NAA B cells quickly differentiate to EF AFCs and mount an early IgM response. Some of the non-NAA B cells that recognize PC-KLH also participate in the early Ab response. 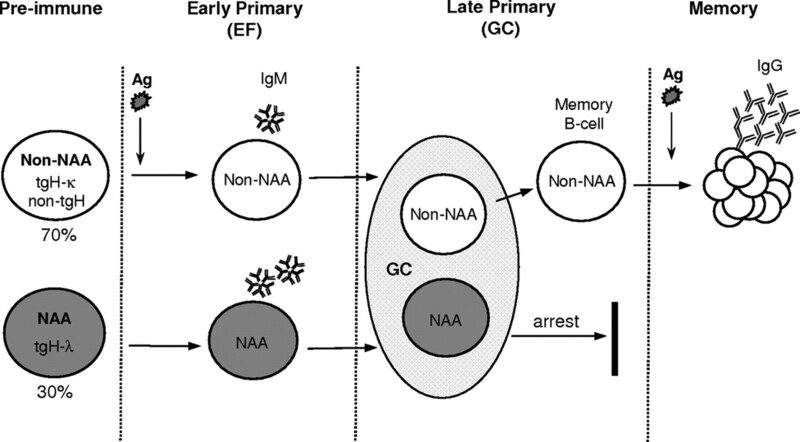 Both types of B cells can enter GCs, but they have different fates: the non-NAA B cells are able to differentiate to IgG memory B cells and post-GC AFCs, whereas the NAA B cells are arrested during their GC development, leading to the short-lived NAA Ab response. 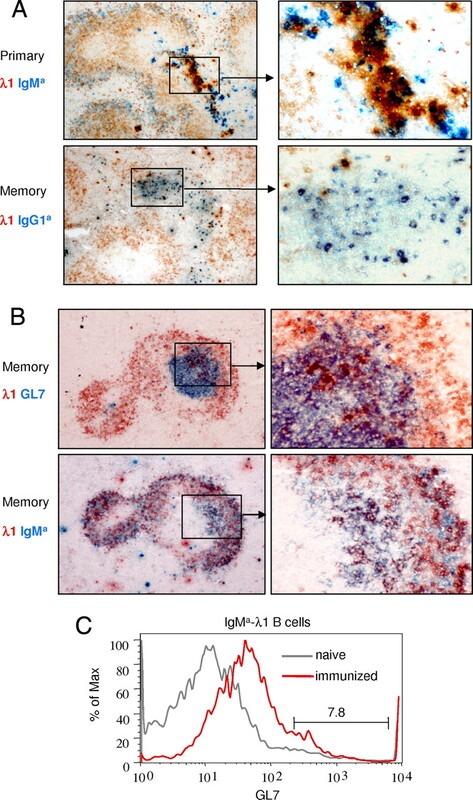 After the secondary immunization, the non-NAA memory B cells undergo extensive proliferation and produce large amounts of IgG Abs. In contrast, the NAA B cells do not proceed to memory response. a Hybridomas were generated from splenic B cells of two ppc1-5H/Jκdel sd-tg mice following the third immunization with PC-KLH (see Materials and Methods). b Presence or absence of ppc1-5H sd-tg was determined by PCR. c VH and JH gene sequences were determined by RT-PCR sequencing. Individual genes were assigned based on the NCBI BLAST Ig Germline Gene Database. The 7183.20.37 and J558.83.189 VH genes were used by more than one hybridoma, but none of the hybridomas in these two VH gene groups were clonally related because they had different CDR3 junctions (data not shown). d Number of mutations per V gene. e Ag binding was determined by solid-phase ELISA as described in Materials and Methods. Relative binding activity was calculated based on OD at 2 h in ELISA and expressed as percentage of original ppc1-5 Ab OD. All samples were tested at the same time using the same concentration (2 μg/ml). f Bold indicates binding avidity higher than ppcl-5 Ab.